I admit that sugar cookies are not my go-to cookies. However, that was before I came across the recipe from America’s Test Kitchen. 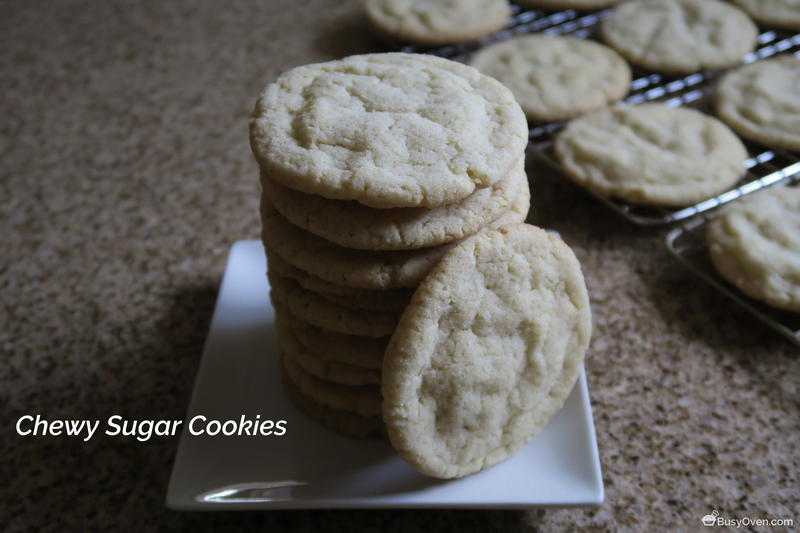 This recipe for Chewy Sugar Cookies is amazing! It produces cookies that are a little crispy on the edges, and soft and chewy in the center. It’s also very simple to make; it took me one hour to finish making about 2 dozen cookies (including the time it took to clean up!). The most noteworthy part about the recipe is its use of cream cheese and milk. The cookie dough ended up being a little softer than other cookie doughs I had worked with before. The soft dough turned out to be a great thing: the sugar cookie dough was very easy to scoop and portion out with my ice cream scoop! These cookies baked for a total of about 11-12 minutes. The edges of the cookies got an ever-so-slight golden hue and also firmed up a little. I had my doubts about these cookies solely because of the cream cheese. As soon as I took my first bite, however, I was won over! There was a very thin layer of crispy and sugary goodness that encased a pillowy, chewy center. It was almost like breaking through a forcefield to get to a magical treasure! I don’t know how else to describe all the goodness these cookies contain! This might be my new go-to cookie! Well…maybe my second go-to cookie; I still love the Brown Sugar Cookie recipe. Adjust oven rack to middle position and heat oven to 350 degrees. Line 2 large rimmed baking sheets with parchment paper. Whisk flour, baking soda, baking powder, and salt together in a medium bowl. Set aside. Place 1½ cups sugar and cream cheese in large bowl. Place remaining 1/3 cup sugar in shallow baking dish or pie plate and set aside. Pour warm butter over sugar and cream cheese and whisk to combine (some small lumps of cream cheese will remain but will smooth out later). Whisk oil into the sugar/cream cheese/butter mixture until incorporated. Add egg, milk, and vanilla; continue to whisk until smooth. Add flour mixture and mix with rubber spatula until a soft homogeneous dough forms. Divide dough into 24 equal pieces, about 2 tablespoons each. Using your hands, roll dough into balls. Working in batches, roll balls in reserved sugar to coat and evenly space on prepared baking sheet, 12 dough balls per sheet. Using bottom of drinking glass, flatten the dough balls until 2 inches in diameter. Sprinkle tops evenly with 4 teaspoons of sugar remaining in shallow dish (2 teaspoons per tray), discarding any remaining sugar. Bake, 1 sheet at a time, until edges are set and just beginning to brown, 11 to 13 minutes, rotating tray after 7 minutes. Cool cookies on baking sheets 5 minutes. Transfer the baked cookies to a wire rack and cool to room temperature. Chewy Sugar Cookies recipe from America’s Test Kitchen.